These Stunning Microscopic Visuals Make It Easy to Envision Chemistry « Adafruit Industries – Makers, hackers, artists, designers and engineers! Thanks to awesome advances in optical technology, today we can clearly see things that few humans in the history of civilization have ever seen before. That’s the guiding principle behind Envisioning Chemistry, an ongoing art-meets-science collaboration between the Chinese Chemical Society and an online education initiative called Beauty of Science. The idea is to make chemistry more engaging to the general public by creating images and videos that bring the fascinating world of microscopic chemical reactions to life. 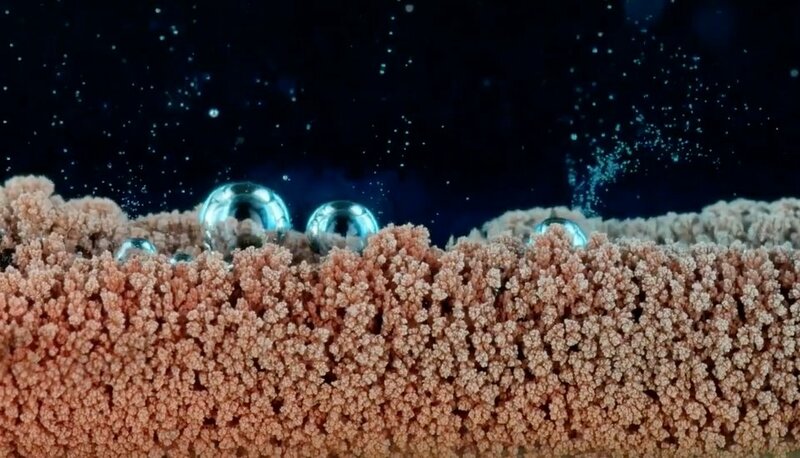 In a series of short videos (viewable below), filmmaker and photographer Wenting Zhu reveals the improbable beauty of chemical processes like precipitation, combustion, and those oddly captivating chemical byproducts known as bubbles. Zhu captured the images in the Envisioning Chemistry series using high-speed cameras, a Lumix GH4100mm macro lens, an Olympus SXZ16 microscope, and thermal imaging, unveiling a tiny world of wonder. Scientists from previous eras could generate these same chemical reactions and even describe what was happening at the microscopic scale, but visualizing and sharing this imagery with the public was a tall order. Like telescopic images of the solar system or pictures of Earth from orbit, Zhu’s videos give us a new perspective on the natural world.